Fashion makeup is used in magazine photography as well as on the fashion runway. Avant-garde makeup is also an applicable technique used for projects that require experimental themes. Fashion makeup is also commonly used in television and film ranging for the natural prime look to more sophisticated applications such as color balance. Stage makeup is used as a method in conjunction with stage lighting to highlight the actors' faces in order to make expressions visible to the audience from moderate distances. This often includes defining the eyes and lips as well as the highlights and lowlights of the facial bones. 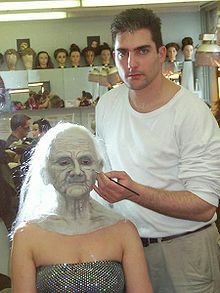 The use of special effects techniques enhancing physical features to exhibit metaphysical characteristics[clarification needed] as well as fantasy makeup. The use of prosthetics and plaster casting are also required for projects that entails non-human appearances. Accents such as theatrical blood and ooze are also techniques applicable to this type of makeup. The use of an airbrush which is a small air-operated device that sprays various media some products and water-based makeup by a process of nebulization. The earliest record of this type of cosmetic application dates back to the 1925 film version of Ben-Hur, it has recently been re-popularized by the advent of HDTV and digital photography, where the camera focuses on higher depths of detail. Liquid foundations that are high in coverage but thin in consistency are applied with the airbrush for full coverage without a heavy build-up of product. Bridal makeup is a new segment in a makeup artist's repertoire. From ethnic, to glamorous, to contemporary, makeup artists are now an important part of wedding planning in Asia, Europe, Africa and North America. ^ "82nd Academy Awards Oscar Nominees for Make-up". Makeup Mag. Archived from the original on 2012-07-16. Retrieved 2010-02-05. ^ "Emmy Awards Nominations Announced". Makeup Mag. Archived from the original on 2012-09-13. Retrieved 2010-02-05. ^ "61st Emmy for Makeup Nominees". Fox News Idaho. Retrieved 2010-02-05. ^ "67th Golden Globe Awards Tina Fey Make Up Break Down". pursebuzz. Archived from the original on 2010-01-22. Retrieved 2010-02-05. ^ "Revisiting the 2009 Make-up Oscar Contenders". Makeup Mag. Archived from the original on 2011-07-14. Retrieved 2010-02-05. ^ "Get paid to apply Makeup". Fab Job. Retrieved 2010-02-05. ^ "AIRBRUSH FOUNDATION MAKE-UP". Airbrush Body Art. Retrieved 2010-02-05. ^ "Top High Definition Makeup". Makeup.com. Retrieved 2010-02-05. ^ Elsworth, Catherine (2005-12-03). "Are they ready for a high-definition close-up?". Telegraph.co.uk. Telegraph Media Group Limited. Retrieved 2007-10-15. ^ Amit Anand Choudhary (April 21, 2015). "Bollywood make-up artists' group inducts first woman after SC rap". Timesofindia.indiatimes.com. Retrieved 2015-04-21. ^ "Salman Khan comes to Katrina Kaif's rescue". hindustantimes.com. 28 June 2014. Retrieved 31 March 2018. Wikimedia Commons has media related to Make-up artists.